What is the detail process of palm oil refinery? The crude palm oil obtained either from palm oil expeller or palm oil processing plant contains impurities, which must be removed to make the oil edible. The process of removing these impurities is called refining. Palm oil refinery mainly includes three sections: Du-gumming and de-acidifiacation;Decolorization;Deodorization and dehydration. 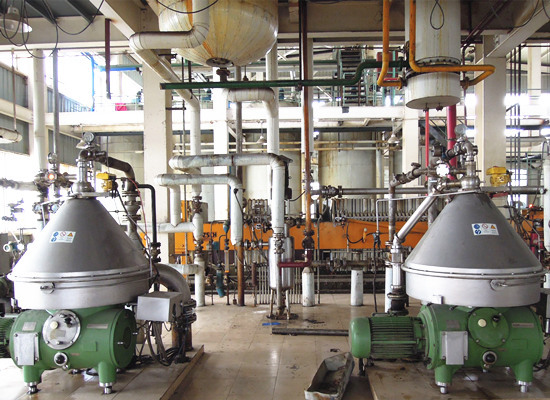 First step of crude palm oil refinery: Du-gumming and de-acidifiacation is not only used to neutralize free fattyacid, but also can act with other materials in oil, like protein, mucilage, phospholipid, pigment, etc. the produced soapstock is kind of surface active agent itself has some absorption, so, also can bring other impurities to soapstock. All in all, alkali refining has the synthetic action of deacid, degum, de-impurity, decolor. Second step of crude palm oil refinery: Decolorization is inhaling the definite quantity decolorising agent (active clay, active carbon) into the oil by vacuum, continue stirring and heating, keep about25mins. Pumping the oil and clay mixture into vibrating filter to remove the waste clay, the decolorization is finished. Third step of crude palm oil refinery: Deodorization process can remove the bad smell of crude palm oil. And because the high temperature in the deodorization, the dehydration is also finished. After the crude palm oil refinery, you will get refined palm oil with good color,smell quality. As a professional manufacturer of palm oil refinery plant, we can supply palm oil refinery plant with capcity 1-1000tpd and we can customized palm oil refinery plant, welcome to contact us for the detail process of palm oil refinery. PREV：How to choose a palm oil mill site to process palm oil? NEXT：What is the usage of palm oil? If you want to know more information about What is the detail process of palm oil refinery?. pls kindly leave your phone number, We will back to you ASAP once we got your message.